Opposition to the war in Afghanistan is at an all-time high. 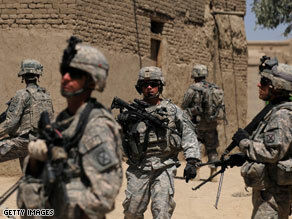 WASHINGTON (CNN) - Opposition to the war in Afghanistan is at an all-time high in a new national poll. Fifty-seven percent of Americans questioned in a CNN/Opinion Research Corporation survey released Tuesday say they oppose the U.S. war in Afghanistan, with 42 percent supporting the military mission. The percentage of those in opposition to the war is up 11 points since April, and is the highest ever in CNN polling since the launch of the U.S. military involvement in Afghanistan soon after the September 11 terrorist attacks in 2001. The poll indicates that opposition to the war is coming mainly from Democrats and independents. "Fifty-seven percent of independents and nearly three-quarters of Democrats oppose the war. Seven in 10 Republicans support what the U.S. is doing in Afghanistan," says CNN Polling Director Keating Holland. "Democrats mildly opposed the war in April while independents and Republicans favored it. But opposition has grown 18 points among Democrats and 10 points among independents." The poll suggests that nearly six in 10 think the U.S. can win the conflict in Afghanistan, but only 35 percent questioned in the survey say that American is currently winning the war. "The public doesn't see Afghanistan as a lost cause," Holland says. "But there may be a lot of Americans who question whether a victory in Afghanistan is worth the cost." The poll's release comes after the two deadliest months for the U.S. military in Afghanistan. In August, 48 U.S troops were killed in the fighting, surpassing the previous high of 45 the month before. On Monday, the top American commander in Afghanistan said in a statement that success in the conflict is achievable if the United States revises its strategy. That statement came as Gen. Stanley McChrystal submitted a long-awaited report on the state of the U.S.-led war in Afghanistan. "The situation in Afghanistan is serious, but success is achievable and demands a revised implementation strategy, commitment and resolve, and increased unity of effort," McChrystal said in the statement. President Barack Obama has called Afghanistan a "war of necessity" and has placed a great emphasis on defeating the Taliban and al Qaeda militants operating there and in Pakistan. The CNN/Opinion Research Corporation poll was conducted Friday through Monday, with 1,010 adult Americans questioned by telephone. The survey's sampling error is plus or minus 3 percentage points. Hey folks, we went into this country to fix it. Right, wrong, or indifferent, we're there now, and we better complete the job, or, given time, Afghanistan will, once again, become a breeding ground for terrorism and Muslim extremism, both internally and externally. We better develope a reasonable plan of action, quickly, and put it into practice. While we were on our misguided action in IRAQ, we lost sight of the incresasing problems in Afghanistan. Now we have to pary the added costs, in material, money, and people, to bring this mess under control. So much for not being interested in "Nation Building". We're stuck now, and we better get this one right, or we'll be doing it again, down the road. WHY, WHY, WHY do we have to be fighting every war that there is. Afghans have been fighting for two thousand years, and they will continue fighting for two more thousand years- regardless if we are there or not. Again, WHY, WHY, WHY do we need to be in the middle of everyone's business. Obama, please make this war over with. Just bring our troops home!!! CNN needs to look for torture cases at Baghram Military prison. There is a lady who has been tortured to the point of insanity by our troops. Her name is Dr. Aafia Siddiqi. She has been held for at least 6 years. She was educated in the US. She has lost two of her three children. Even the Pakistani government has assigned lawyers to free her. But our government has ignored her plea. She is currently held in one of New York city's maximum security prison and held under isolation and awaiting trial in New York City. There has demonstrations asking for her freedom by American Citizens but no coverage in the media. This story needs to be reported in order to inform the public of the horrific tortures that have been committed under the name of the American People names and for their security. I think once her story is told people will get to decide for themselves why torture is a crime against humanity and that those responsible for this policy should be tried. Her story needs to be told in order to show that an impartial press still exists on this planet..
Don't forget it is OB's war since January 2009. Personally..., I could never tire from freeing the oppressed. Just another NO EXIT STRATEGY WAR by the BUSH ADMINISTRATION !!! We got Saddam, we liberated Iraq, bring our troops home. This war is not something we can afford. Let's bring the troops home and try to get our National debt under control. If we can't get this debt under control, we will crumble from within vs having a terrorist doing it from without. The debt is much more serious than killing every terrorist in Afghanistan. Besides, we won't ever achieve this and this war isn't a winnable situation. I TOTALLY AGREE-BRING OUR TROOPS HOME!!!! shouldn't there be daily reports on deaths on the front page (not buried in a ticker) like we did for IRAQ? I am independent but not opposing the war against the terrorists. I am opposing any illegal war and I didn’t think the Afghanistan war was legal. Invading , occupying, or interfering the sovereignty of any country is illegal. Taliban provided the safe haven for the extremists/terrorists but the people of Afghanistan didn’t. After ousting the Taliban, the US should have left the country and let the Afghanistan people take care of their own business. If they can’t take care of themselves then who can? There will be no winner in this war, unless … if and only if the people of Afghanistan want to win the war. Did you people forget 911? They were the terrorists. Did you forget they are advancing and in pakistan to get the nuclear weapons? Must have short term memories, we need to win. Americans sure want something badly there, you don't spend hundreds of billions of dollars so a backwards country can have a democracy. And you've only antagonized terrorists and exponentially increased their numbers by being there. Why is only 4% of the money you spend there go towards building hosptals, schools, food, medicine? Obama is the POTUS. He can end this war at any time of his choosing. He simply chooses not to at this time. This isn't "Bush's war" anymore folks, it is Obama's. Laughable. Liberals are absolutely laughable. This is not Bush's War. This became Obama's War in 2009, especially considering all of the anti-war speeches he delivered on the campaign trail, promising to get the job done and bring our sons and daughters home. Now that he's in the office, he sees what real presidential decision-making is all about. He must feel foolish for all the lies he spewed forth. Foolish or arrogant. Maybe the Independents who voted for him are the ones feeling foolish? where were all this guy when we were fighting in Iraq for no reason.